This photo is in response to the photo "Big Load" by Barbara Watt. Would the "Kingsnorth Fisher" be a sister Ship of the one above? I seem to recollect the Kingsnorth being up docked in Kirkwall with new Diesel engines in parts for the Power Station, probably in the 1970s, Date is a guess. Added by Phil Brough. I remember the Kingsnorth Fisher but not the Aberthaw Fisher. This is great Steven. Thank you very much. Yes, sorry, your absolutely right. She had an identical sister KINGSNORTH FISHER so that will be the one. Yes there was, but she was an old coaster, I did my first trip to sea on her in 1956-57 era..
Jimmy, what was the name of the coaster that rolled over at Duncansby Head loaded wae boom nets fae Lyness? Wiz she a "Fisher" boat? that was the Sound Fisher, she loaded after us and sailed about 30 hours after us, bound for Ghent same as us, wi a big deck cargo of boom nets, and big blocks in the hold , they moved and the ship went over , without loss of any crew members luckily... River Fisher suffered a similar end of Lexioes some time later.. 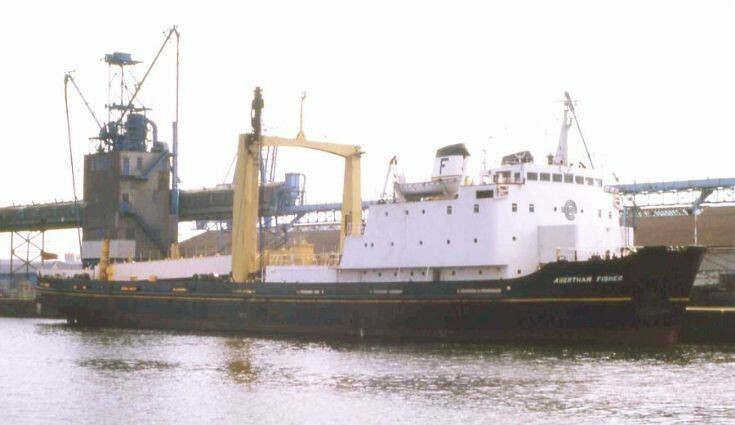 The Aberthaw Fisher was in Kirkwall quite a few times in the 70s. I think she brought in a lot of the plant for Oceaneering laying the pipeline to Flotta. I saw her in Sea Breezes a few years ago she had been converted for some work in the Gulf and looked like a floating scaffold, the article stated she was then being towed to India for breaking. Shae sank 4 miles ESE of Wick.